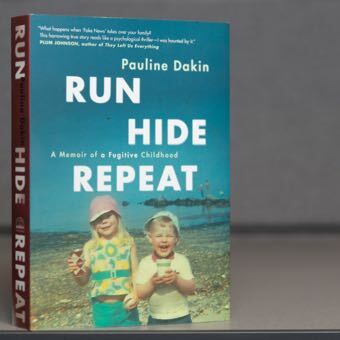 Waterloo – Author Pauline Dakin is the winner of the 2018 Edna Staebler Award for Creative Non-Fiction for her memoir, Run, Hide, Repeat: A Memoir of a Fugitive Childhood (Viking). In addition to Run, Hide, Repeat, the shortlist for the 2018 Edna Staebler Award included: Life on the Ground Floor: Letters From the Edge of Emergency Medicine, by James Maskalyk (Doubleday Canada), and A History of Canada in Ten Maps: Epic Stories of Charting a New Land, by Adam Shoalts (Allen Lane). Thursday, Nov. 8 from 3:30 p.m. to 5 p.m.: Award presentation and book reading in the Robert Langen Art Gallery and Library on Laurier's Waterloo campus. Friday, Nov. 9 from 11:30 a.m. to 1 p.m.: Meet the author, room CB100 (Reid Lounge) of the Carnegie Building on Laurier’s Brantford campus. Panel judges for the 2018 Edna Staebler Award for Creative Non-Fiction included: Sharon Brown, Laurier librarian emerita; Bruce Gillespie, associate professor in Laurier’s Digital Media and Journalism program; and Anne Russell, former professor in Laurier’s Department of English and Film Studies. The $10,000 Edna Staebler Award for Creative Non-Fiction recognizes Canadian writers for a first or second work of creative non-fiction that includes a Canadian locale and/or significance. Established and endowed by writer and award-winning journalist Edna Staebler in 1991, the Edna Staebler Award for Creative Non-Fiction is administered by Wilfrid Laurier University, the only university in Canada to bestow a nationally recognized literary award.